It's all about love during the Valentine's Week. So far we've read about book love from the reader's perspective but let's change that with the last story in our project. It's high time to look at the storytelling from the writer's point of view. We've invited author Ned Hayes to present his book love story. Storytelling is a calling: we manufacture meaning out of events through the act of storymaking. After all, the human experience doesn’t really make sense on a day to day basis. Story is a fabric laid transparent over the bumps and bricks of random occurrence, a map showing the past and the future. It is as if we weave a web of story, from inside ourselves, like a spider, and live in it, and call it world. I believe that story is in fact all powerful in our lives. To be truly human is to tell stories. Without stories – without that rhythm of beginning, middle, and end, without that hopefulness of meaning being given by seeing the pattern of a story – I believe that we become less than human. I believe that storytelling is what makes us human. We are homo storytelli or homo sinificans, the storytelling creature. This idea of the importance of storytelling was first brought to my attention by the wonderful little book The Dark Interval: towards a theology of story, by John Dominic Crossan. The critic Frank Kermode also wrote a book called The Genesis of Secrecy: on the interpretation of narrative that made an early impact on me. And finally, Annie Dillard’s book Living by Fiction also influenced my ideas about what was possible in fiction. Today, I write stories because they give me a way to make sense of the world. The world is a complex place, so I don’t restrict myself to one genre or one style. I’ve now written three novels that have ranged across the spectrum of storytelling, from mystery to historical fiction to young adult literary fiction. In telling stories, I can also help others to also make sense of this often-confusing and often frustrating world as well. The web I weave can be of use to many people. I’ve discovered this to be true most recently through talking to readers of my bestselling novel The Eagle Tree. In this novel, a young boy on the autistic spectrum wrestles to bring together his disintegrating family as he strives to climb an old growth tree. He is trying to make sense of his reality, and in this poignant and difficult story, he finds a great meaning and purpose for his life. I thought The Eagle Tree was a unique and unusual story. Yet what I’ve been happily surprised by is that many readers have written me to tell me that I successfully captured part of their story of life on the autistic spectrum. They have said to me that I have “told their story” or that my story “helped to show that my son’s life makes sense.” I’ve also been told by other readers that the difficulty of interacting with a family member who has development or neurological differences are described with authenticity and with compassion. They found meaning this book as well. My small words helped to give hope to their experience and made their stories matter. The Eagle Tree is a story that brought meaning to their lives. Yet along with authenticity, there’s one other duty that novelists have: Entertainment. Entertainment = storytelling as a moral duty. We have the deep and meaningful charge to write something that’s entertaining. We are not allowed to tell a boring or meaningless story. Our stories must be interesting, must be inventive, must – in the end – be entertaining to our readers. Entertainment sometimes gets a bad rap. People think it’s a waste of time. Yet entertainment need not be shallow. Storytelling as entertainment doesn’t need to be meaningless. We don’t have to create something false like The Transformers – because a story like The Hunger Games or 1984 is equally entertaining, yet contains deeper truths and gives insight along with its momentum. Entertainment means delivering a tale that can lift us out of our present reality and give us a vision of something beyond our mundane reality. A good story tells the truth, and carries us along on a tide of hope and insight. This is why I like to read fantasy, horror and science-fiction. These genres don’t hide their attempts to entertain: these types of books wear their badges of entertainment on their sleeves, plain for all to see. Even the covers of these books communicate their intent, with their spaceships and unicorns and fantastic sorceries. Some of my favorite fantastical and horrific stories include John Milton’s Paradise Lost, Garth Nix’s Abhorsen trilogy, The Ritual by Adam Nevill, and Tim Power’s The Stress of Her Regard. In the science-fiction realm, I also have special favorites. Some of the stories I admire the most in these areas include The Sheep Look Up, by John Brunner, Parable of the Sower, by Octavia Butler, and Downbelow Station by C.J. Cherryh and of course, many books by Ursula Le Guin, most notably The Left Hand of Darkness. All the books I’ve named above provide wonderful entertainment while providing deeper insight. Yet the charge we bear to entertain goes beyond the simple affectations of fantasy and spaceships. As storytellers, we have a moral charge to give our readers a removal from the world, an escape hatch into a new way of thinking. Even literary fiction must entertain – it must deliver some insight and tale that lifts the quotidian events of our lives into a higher mythical and hyper-realistic realm. The story must move us. I found this truth brought home to me when I wrote my second novel Sinful Folk. The famous literary agent Jenny Bent read the first draft and told me “This is beautiful writing, but there’s not enough real storytelling here.” So over the course of one year after I received Ms. Bent’s feedback, I rewrote the entire book to bring my characters from just a land of beautiful (yet un-entertaining) prose into a story that was worth the telling. To learn how to tell an entertaining piece of historical fantasy, I went back and re-read some of the masters of historical fiction, especially those who wrote about the medieval period. The books that most influenced my approach to historical storytelling included Morality Play by Barry Unsworth, Ella March Chase’s The Virgin Queen's Daughter, Brenda Vantrease’s The Illuminator, Kathryn Le Veque’s The Warrior Poet and Karen Maitland’s The Owl Killers. The story that I re-wrote as the novel Sinful Folk was finally published. It had become a heartfelt and harrowing tale that moved my main character – a fourteenth century woman – from a place of peril and heartbreak through great danger until she achieved the heights of power and privilege. My character changed over the course of the novel, transforming from fearful subterfuge into a driven, motivated heroine who conquered the High Court of England. I changed the book into a real story. And when Sinful Folk was finally published, it was described by New York Times bestselling author Brenda Vantrease herself as a “A pilgrim tale worthy of Chaucer, delivered by a master storyteller” and received starred reviews in BookList, BookNote and many other publications. In fact, all of the authors I list above -- whose work I read as inspiration – ended up endorsing the novel Sinful Folk (with the exception of Barry Unsworth, who had unfortunately passed away just before I published my novel). I think this love of authentic tales that entertain goes back to my childhood, when I found myself alone much of the time. And alone with only a good book to read. So books became my companions and my friends. Donna Tartt points out that “Books are written by the alone for the alone.” C.S. Lewis said “I read to know that I am not alone.” This is true of every reader. We read to connect with other human perspectives, to know those voices and embrace those souls. We also read to be accompanied by other voices in our solitary trek through time. When I was a child, the books that brought me companionship included Mischief in Fez by Eleanor Hoffman, Ursula Le Guin’s Earthsea Trilogy, J.R.R. Tolkien’s The Lord of the Rings and finally, a story I’ve re-read many times – the deep and meaningful Watership Down, by Richard Adams. Hoffman’s work brought me into other worlds, and showed me possibilities beyond my ken. Le Guin demonstrated the power of brevity in telling a fascinating tale, while Tolkien showed that fantasy could tell deeper truths, even while being tremendously entertaining. Adams continues to show me – every time I read him – that deep and powerful stories lie all around us, even in the lives of rabbits and seagulls, and that all we have to do is pay attention. The web of story surrounds us: all we have to do is open our eyes. Today, the tales told in these stories still resound in my dreams, and still are echoed in the books I write today. Finally, for anyone who is interested in telling a story, it’s important to note that listening to a story is how you become a story-teller yourself. I believe that to tell stories, we must read stories. Writers are readers. Therefore, I recommend anyone who wishes to write first become an avid reader. Read a book a month, a book a week, even a book a day. Become a reader, and you will be well equipped to be a writer. And you will never be alone as long as you have books and the tales within them. And what's your book love story? 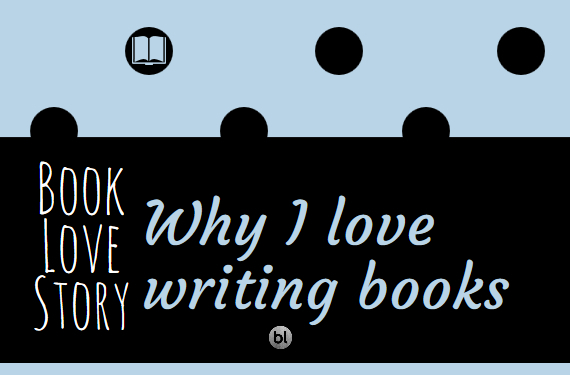 Join our project, write your story, publish it on your BookLikes blog and tag with why I love tag so we could find it and share it. You can also add the link to your book love stories in the comment section below. Dear BookLikers, writers and readers, thank you so much for participating in this amazing project. Presenting all those stories to You and about You was a fascinating time and we hope that you've enjoyed the book love story week as much as we did.